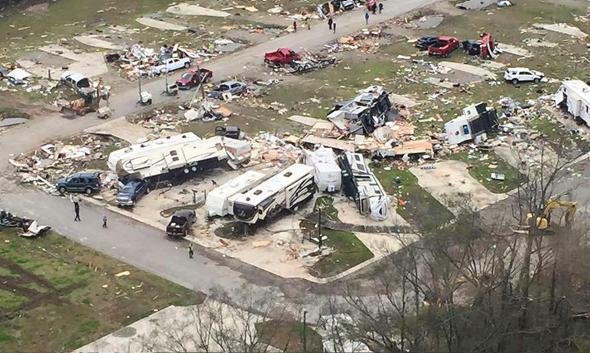 February tornado outbreak hits the South. Wreckage covers the grounds of a mobile home park on Wednesday in Convent, Louisiana, a day after it was hit by a tornado. The calendar may say February, but in some parts of the country, the atmosphere thinks it’s May. At least 29 tornadoes were reported across five states from Louisiana to Florida on Tuesday night, killing at least three and injuring dozens. An unusually strong winter storm system created the tornado outbreak and is expected to continue producing severe weather on Wednesday from Florida to the New York City area. At several points throughout the evening, multiple tornadoes were ongoing simultaneously and several areas were especially hard hit between New Orleans and Pensacola, Florida, where the National Weather Service had issued a “particularly dangerous situation” tornado watch. Buoyed by a strong jet stream linked to the record-strength El Niño, and slightly warmer than average Gulf of Mexico waters for this time of year, the storm packed an unnaturally springtime punch, producing a month’s worth of tornadoes in a few hours. On Tuesday morning, before the storms began, the National Weather Service estimated a near-record level tornado risk for the date, about 50 times higher than the historical average for late February. After forming over the Gulf of Mexico, one particularly intense tornadic thunderstorm struck near Pensacola, Florida, with damage “equivalent to a landfalling hurricane,” by one meteorologist’s estimation. The Florida Department of Transportation closed a 26-mile stretch of I-10, and storm chasers tweeted horrific scenes, including people thrown from homes. Earlier in the day, in Louisiana, several tornadoes and waterspouts tracked across Lake Pontchartrain, and storms tossed at least one car into the sky in nearby Mississippi. Meteorologists at the New Orleans office of the National Weather Service were forced to abandon their posts and seek shelter. One of those meteorologists, Mike Hill, told me in a tweet that the weather radar was rendered inoperable by a lightning strike. Though relatively rare, the NWS has contingencies for such situations—the office in Lake Charles, Louisiana, assumed New Orleans’ forecasting duties, and the surrounding radars in Alabama, Mississippi, and Louisiana provided overlapping coverage. A mobile home park in Convent, Louisiana, was hardest hit there—Gov. John Bel Edwards visited the park within hours after the storm, calling it a “minor miracle” that only two people died. A 2014 study by leading tornado researchers found that tornado season, on the whole, is becoming more variable. Recent years have seen an increase in the number of big outbreak days, like Tuesday’s, even as overall tornado numbers have remained relatively stable. Global warming may be contributing to this, by providing additional energy and moisture to storm systems capable of producing tornadoes by enhancing the overall atmospheric evaporation rate. At the same time, wind shear, a necessary component of tornado formation, may be declining overall. The result is an increase in “bunchiness”—increased year-to-year tornado variability along with greater odds for occasional days, like Tuesday, when all the ingredients come together to create tragic scenarios. On Wednesday, as the storm system moves north and eastward, an even rarer tornado risk is materializing over parts of the Carolinas and Virginia. Much of North Carolina will see tornado risk about 100 times greater than the typical level of late February, with a few especially strong tornadoes possible. The latest high-resolution weather models show a line of particularly intense storms moving though Washington, D.C., Philadelphia, and New York City between about 6 p.m. and midnight. Meanwhile, 12 to 18 inches of snow and blizzard conditions are expected in the Chicago area, along with 15-foot waves and tropical storm force winds over Lake Michigan.